i've shot this car a couple of times now, on a couple of occasions. not particularly one of my favs, but it is clean, and it is shiny. wasn't going to bother posting it, until my better half mentioned something the owner said to him. well, he didn't say it to me, so i won't retell it here (yet). 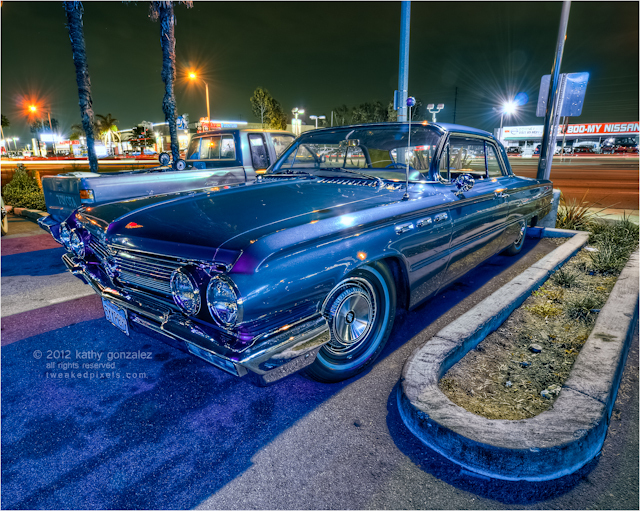 he just so happened to have parked his baby here, in one of my favorite spots, with a conglomeration of lighting. apparently, there was too much of a fluorescent light hitting it, and it effed with the blue of the paint. colorful, and the white fluorescent still manages to wash out the island too. on another topic, my better half and i stopped by the irvine farmer's market car show last sunday at the irvine "great" park. i think it was maybe the second week. weather wasn't too bad, just a bit chilly. hadn't rained yet. hauled all our stuff out of the trunk, and with tripod in hand, headed over toward the "car show lot." was maybe a total of 5 cars that i would consider trying to be a show. only one maybe worthy of shooting, but the doors were open, and there were kids hanging around it and welcome to sit in it. some sort of 1920s or 30s car, kinda chitty chitty bang bang. skipped it. then the same silly pt cruiser i see often, with fake bullet hole decals and gangster dolls in the back, instead of sitting in the driver's seat. never shoot it. couple of '60s or 70s beaters and that was it. so the show was a bust. didn't even take a token shot, which i usually try to do. so we walked quickly around the market place. noisy vendors, shouting as you pass by. food vendors were particulary obnoxious, and their wares were more pricey than other farmer's markets we've been to. so pfft. i worked on a proposal back in the day for building the "great" park. our proposal lost, but the winner had so much overreaching promise, and it's so disappointing that it's been hung up in red tape and politics for this long. poor use of the money they talked us out of in taxes. would have been better for them to have kept the marine base open (thanks clinton), at least the air shows and men in uniform were pleasing to the eye.